Once you’ve installed a dishwasher, it becomes a crucial part of your home that you can’t live without. It’s an appliance that helps you in more areas of your life than you might realize – sure, it helps to keep your kitchen clean and free of clutter, but it also frees up more time in your life for the things that truly matter. In other words, your dishwasher helps your life run smoothly in more ways and one! So if you want a prompt, affordable, same day, one-time Dishwasher Repair service inToronto, it’s time to call Toronto Refrigeration Appliance Repair Service. At Toronto Refrigeration, we understand how important it is that your dishwasher stays running – which is why we’re so proud of the extensive Toronto dishwasher repair services we offer. 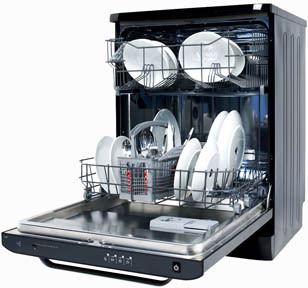 No matter what the problem is, we make your dishwasher – and, by extension, your comfort and convenience – a priority. If you’re looking for the best dishwasher repair Toronto has to offer, look no further than us! We pride ourselves on offering the most reliable and efficient same-day, one-time dishwasher repair in the GTA. Our dedicated dishwasher repair people and technicians are intimately familiar with the ins and outs of your machine, so you don’t have to worry about any second-guessing when it comes to your appliance. From smaller jobs like fixing faulty water pumps to heating elements that aren’t quite working like they should, all the way to installing your new machine, we can take care of it all for you. Our technicians are prepared to work on all major makes and models of dishwashing units, and we’re so confident in their skills, we even provide yearly service plans and extended warranties for most models! Call us today to book an appointment and see the difference a company that genuinely cares about appliance repair can make. If you are experiencing anything from the list of problems below, be sure to call us immediately! My dishwasher is leaking water. The water is not draining from my dishwasher. The water will not fill in my dishwasher. My dishwasher runs its cycle, but my dishes are still dirty. My dishes are not drying. There are spots and stains on my dishes. My dishwasher is making strange noises. My dishwasher is taking too long to complete a cycle.